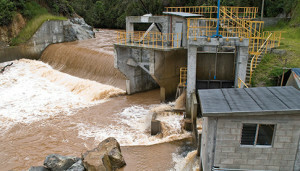 The project consists of the installation of a small hydroelectric energy plant to produce clean energy using the water flow of Guadalupe River (Antioquia). The total installed capacity is 9,76 MW and it is expected to generate 59,8 GWh of renewable energy per year, that will be distributed to the National Interconnected System of Colombia. The project will increase the electricity supply to the National Network, replacing the electricity generated from fossil fuel burning with electricity generated from renewable sources, reducing greenhouse gases emissions. Fulfilling the totality of the environmental regulations of Colombia. Reforestation of a small area close to the project, to offset the deforestation impacts produced during the execution of the project. Reduction of the dependence on fossil fuels, as no new thermal energy plant is constructed. Mitigation of the emission of CO2, SOx and NOx, encouraging the reduction of health problems associated with atmospheric pollution. Minimal ipact to the ecological surrounding, as the project is developed in a grazing livestock area, free of endemic species. Creation of 100 full time work places during the period of the project construction. Construction of a health clinic in the town of Providencia. Construction of a meeting room and dining room in a local school. Construction of more than 5 kilometers of roads to communicate the farms. It contributes to the technological capacity development around the country, due to the increase of the technological capacities of workers learned during the project.